One giant leap for movie audiences. It is relatively rare to find a film script that has more stretch marks than the hordes of middle age white-trash moms I saw Schlitterbahning this past summer, although in their case the stretch marks are usually hidden by massive waves of pasty white flesh that covers the unsightly lines as they waddle past wearing their skimpy two-piece Catalinas. Looks like an invasion of beached Beluga whales. Alas, screenwriters Mark and Michael Polish make no effort whatsoever to mitigate the countless unforgivable stretches of credibility existing in their screenplay for THE ASTRONAUT FARMER. The audience is given no respect; it's as if they felt Rodney Dangerfield was the only one who would bother to watch. This comes as a huge surprise since the Polish Brothers -- identical twins by the way -- also wrote, directed and starred as the Siamese twins in TWIN FALLS IDAHO, a wonderful film that critic Roger Ebert described as having "no payoff, no answer, no solution and no resolution," yet he still declared it one of the best movies released in 1999. (For the record, there's no comma in the title either). Clearly these guys have talent, and as exasperating as the script for THE ASTRONAUT FARMER is, Mark and Michael still manage to pull off an entertaining film. It's like digging a six-foot deep hole and ending up with a small flower growing atop the grave -- one that smells like a rose. 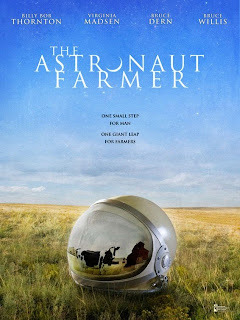 At it's core THE ASTRONAUT FARMER is a fantasy film about the need for fantasy -- or at least dreams. Remember the good old days when we were told that it was o.k. to dream and that when we grew up we could be anything we wanted to be? Remember when being "free, white and 21" actually meant something? Well, the Polish Brothers still believe and they are not ashamed to give us a little dose of Capracorn even though Frank is long since dead, as is the "American Dream" for so many among us. All-in-all this Polish Pollyanna is a good thing, a very good thing indeed, and so even though they play us like a Stradivarius and they do so with gargantuan plot holes and a virtual disregard for logic, I came away actually liking the THE ASTRONAUT FARMER. 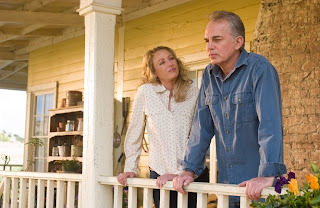 Of course, it doesn't hurt to have an excellent cast headed by the always reliable Billy Bob Thornton and the always radiant Virginia Madsen who just gets better and better in every film she appears in. Bruce Willis has a significant part as a real astronaut, but for some reason he is not credited. Odd. And speaking of odd, Bruce Dern plays the grandfather living with the Farmer family. (Yes, the family name is "Farmer" and Billy Bob plays a farmer -- well, he's more of a rancher actually, but this is a minor quibble). Special mention should also be made concerning the Farmer children, played by Max Thieriot and Jasper and Logan Polish. These kids were, unbelievable as it may seem, totally believable. 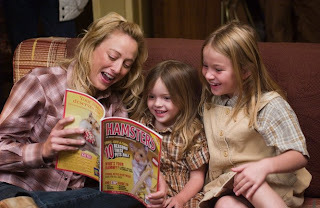 It's rare to find a reel family acting like a real family, but these three young actors were flawless in their performances. 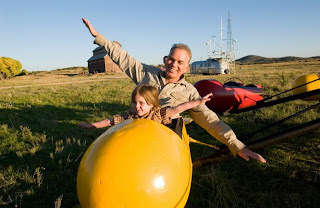 Rounding out the most memorable cast members is J. K. Simmons as the FAA jerk determined to stop Mr. Farmer from launching his rocket into U.S. airspace. As many of you know, I am a private pilot, instrument rated, and I own a 35 year old Cessna 172. Speaking for pilots everywhere, having the FAA bureaucrat portrayed as such a pompous villain is right in step with the unofficial, but highly accurate FAA motto: "We're not happy until your not happy." NASA spent billions of dollars to bring us Tang and Velcro and, allegedly, a few moon rocks. The Polish Brothers spent around thirteen million to bring us THE ASTRONAUT FARMER -- if only they had spent a few additional shekels on plausibility.